How about an ice-cream parlour?” is one of the more unusual suggestions for an interview location. But this is Geoffrey Canilao – conventional, he isn’t. A short Uber from Tales of the Cocktail Edinburgh and we’re pulling up stools in one of the smallest ice-cream dispensaries not on four wheels, finding space between the courting teenagers who queue to get their date-day fix. Canilao is excitable – perhaps more than usual. He’s got an idea. His bar, Balderdash in Copenhagen, will be ice-cream parlour by day, bar by night. Not just any ice-cream though. Ice-cream cocktails – or at the very least, ice-cream laced with booze. It’s the latest innovation this second-generation Filipino New Yorker is dropping from a height on unsuspecting Danes. Canilao’s first Copenhagen job was running Union, which, helpfully, drew inspiration from Employees Only. But once his feet were under the designer table, he opened Balderdash, showcasing his forward-thinking drinks (fermentation, exotic ingredients – beaver gland anyone?). While Balderdash is artistic, it is also hedonistic. There are stories to be told, just not here. 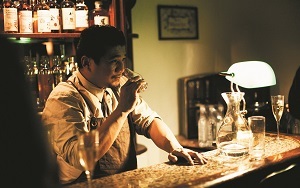 But Canilao is not just about crazy drinks and crazy times – he is at the forefront of the local community too. The event he co-organised, Copenhagen by the Glass, attempted to find ties and share ideas between all ends of the hospitality industry. Amid the ideas, plans and projects that seep out of every Canilao sentence, the Balderdash ice-cream parlour concept seems achievable… almost conventional. “Maybe I’ll buy my own cows,” he says. Conventional Canilao isn’t.